Cyndie and I understand that we are rarely alone on our evening outings to walk the dog, even though most nocturnal visitors go undetected. It’s usually apparent when Delilah recognizes we have company, if she picks up a fresh scent and strains against the leash with startling urgency, but even she fails to notice sometimes. I always wonder what might be just out of the reach of my headlamp. Occasionally, the sudden rustling of branches startles me when it is a deer that finally decides it’s time to bolt away from the too interested dog making lunges in their general direction. Last night, Cyndie didn’t get out to shut the chicken coop until it was pretty dark outside. As she and Delilah arrived near the coop, Cyndie heard a rustling that alerted her to make a hasty approach. She hooked Delilah’s leash to the paddock fence and rushed to close the chicken door. The scuffling sound moved from the leaves on the ground to the branches of a small tree just two steps from the coop. Hello there, opossum. What brings you to our free-range chicken’s neighborhood? We’re thinking we might not want to wait so long to get the coop secured for the night any more. 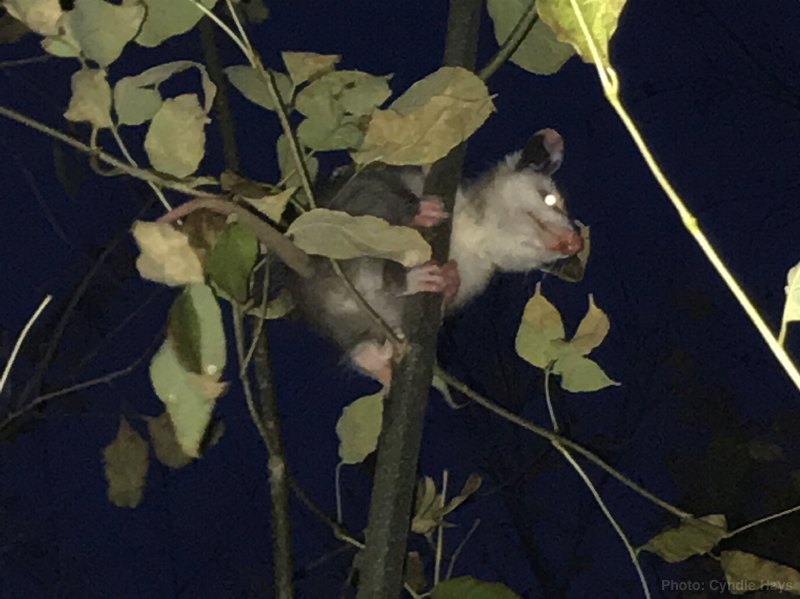 I wonder if the raccoons, skunks, barn cats, fox, neighbor dogs, and now, opossums around here are all friendly with each other, or if they actually avoid interacting somehow in their frequent evening forays through our territory. It’s been like Grand Central Station lately with the visiting critters. Maybe they have booked tickets on different successive days. At bedtime Sunday night, there were two beady masked eyes peering in our bedroom door from 4-inches off the deck. I think the snoop was hoping to get another glimpse of Pequenita. The cat was ferociously trying to scare off a curious raccoon a while back, but instead of fear, that evening the visitor looked rather smitten. Cyndie said she decided to avoid further interaction with last night’s opossum. With the horses all bunched nearby in the corner of the paddock to see what all the fuss was about, and Delilah tied nearby, Cyndie didn’t know how the tree rat would react if she challenged it. Might have just “played possum,” but she decided not to tempt a more chaotic result.